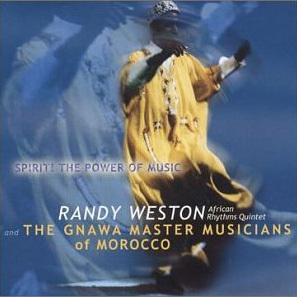 In the fall of 1999, at Brooklyn’s Lafayette Presbyterian Church, Randy Weston’s African Rhythms Quintet & the Gnawa Master Musicians of Morocco-from both Marrakech and Tangier-were recorded live. Their performance opens with a piano tripartite cogitation titled “Receiving the Spirit.” Desolation and emptiness are the thematic control of “Origin,” its first part. Talib Kibwe on flute then illuminates Weston’s murky joie de vivre on the following portion, as if a spiritual entity were to swirl atop enlivening an underlying maelstrom. Curiously, through these initial sections, there are melodic figures that seemed straight from the Peruvian bolero “Amor por Ti” by Lucho Barrios. Still, before the third and final portion of Weston’s best exposure through the recording, he engages the middle and left geography of the piano with sparse fierceness ahead of Benny Powell’s trombone storytelling on the instrument’s lower register. On the other hand, the initial pairing of the hag’houge, a percussive Moroccan stringed instrument, with Alex Blake’s acutely thick and deep acoustic bass playing signals the bassist’s pervasive enhancements to the date. The Moroccans play and vocalize various songs, with Blake’s percussive bottomed heaviness in tow, following Islamic prayerful call and response patterns, thus providing the core of the production. Communality ensues at the end and all musicians jam it up with a frenetically disciplined rich musical release that would make for a suitable performance in Marrakech’s famous Jemaa el Fna town square.